Get to know the “rain fish” that come to life during rainstorms in this gorgeous exploration of nature with vibrant collage artwork from the Caldecott Honor-winning illustrator of Chicka Chicka Boom Boom. 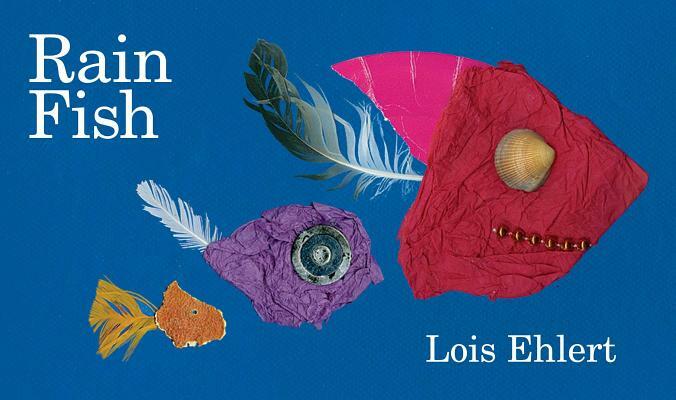 Through lyrical text and her incomparable mixed-media collage illustrations, Lois Ehlert introduces readers to “rain fish” -- the varied, colorful, and unique little collections of materials that float along on streams of rain water during storms. From a scrap of newspaper with a seashell eye and feather smile to a piece of cardboard with an orange peel eye and a leaf for a fin, Ehlert's rain fish come in all shapes and sizes. Complete with an author's note explaining how Ehlert collected the found materials she used to make the book over the course of a year, RAIN FISH is a spirited celebration of imagination, creativity, and observing the world in your own way -- and it invites you to discover your own rain fish.